Papers are invited for an ASTM symposium on Thermal and Oxidative Stability of Biodiesel Blended D975 and D7467 Compliant Fuels: Excluding S5000 Grade Fuels, to be held June 27 at the Fairmont Queen Elizabeth Hotel in Montreal, Quebec, Canada. EPA published compliance data on the RFS for November 2012. According to the agency, no D3 renewable identification numbers (RINs) were generated during the month for cellulosic biofuels; however, I,741 D7 RINs were generated for cellulosic diesel. The reinstatement of the biodiesel tax credit makes the advantage of Brazilian ethanol over biodiesel smaller, but researchers note that there will still be an economic advantage for blenders to use Brazilian ethanol rather than domestic biodiesel. With December methyl ester production figures still pending for 2012, the U.S. biodiesel industry is on pace to again produce more than 1 billion gallons of advanced biofuel during the year, supporting more than 64,000 jobs across the country. Algae.Tec was approved for a $12.8 million cash refund on Australian and overseas development expenditure from the Australian government for the financial years June 30, 2012, to June 30, 2015. 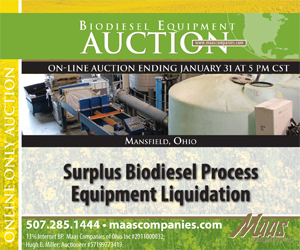 The cash will help fund three bioreactor facilities. "Obama and I share a deep appreciation for rural America and its unlimited potential in the years ahead to feed a growing world population, revolutionize America's energy, further protect our natural resources and create more jobs," Tom Vilsack said. 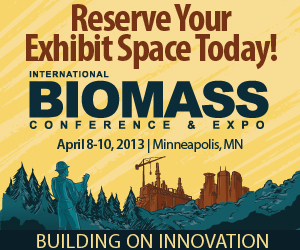 The 2013 IBCE agenda featuring four comprehensive tracks is tightly focused on leading-edge developments in the biomass industry, from cultivation, harvest and storage to conversion technology, project finance and regulatory guidance.